Hollings Sausage is made of 100% natural quality air dried treats. 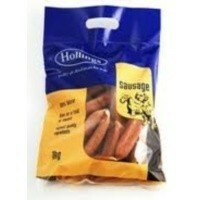 Hollings Sausages are suitable to give as a treat, reward or training aid. When feeding to your dog always ensure that fresh, clean water is available. Analytical Constituents: crude protein 40%, crude fibre 2.5%, oils and fats 36%, crude ash 7%. Too much variation between batches to really recommend. Mostly very good though.